Trinity College, ‘Mind yourself’ and lundbeck’s treatment of an employee with depression! 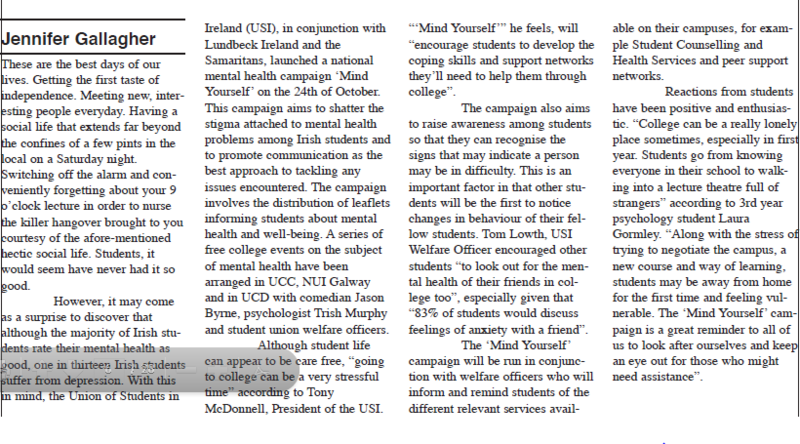 USI launch “mind yourself” mental health campaign. Considering the fact that on lundbeck’s website they state this…“We have taken upon ourselves the task of improving quality of life for persons with a psychiatric or neurological disorder“, they don’t really practise what they preach when it comes to an employee suffering from stress and depression. This is a case concerning Francis Acquah who was employed by lundbeck as a specialist representative. The Applicant was employed as a Specialist Representative with Lundbeck Australia since August, 2000 and had always received positive appraisals on his work performance. Mr.Acquah won a number of Specialist of the Month awards as well as a Special Award in October, 2000 for his work performance. In the space of two years the Applicant had six new managers, which not surprisingly affected his performance and after failing a section in a product knowledge quiz, and subsequently receiving a written warning and feeling he had to sign the corresponding document under duress, he went on sick leave and was found to have a work related stress disorder (acute stress). It was later found, by his G.P that Mr.Acquah was suffering from anxiety, panic attacks, and depression. In Mr Acquah’s evidence, he stated that during his sick leave, he was subjected to a continuous stream of contact from lundbeck coupled with requests to return equipment, which only added to his sense of `excessive pressure’ that he felt he was under from Lundbeck about his situation at work and that it was `just too much’. Mr Acquah gave evidence that (along with a steady stream of faxes) he would have received a phone call from the office `about every two days’ while he was on sick leave. Mr Jacob, the human resource manager at lundbeck, told the hearing that these various forms of contact with Mr Acquah while he was on sick leave were well-intentioned and were meant principally to ensure he was covered by some form of paid leave during his absence. Hmmm. This was AFTER management at lundbeck became aware that Mr.Acquah was also looking after a disabled child at home. Mr Acquah gave evidence at the hearing that upon receiving a fax concerning his sick leave, drawing on his own expert knowledge as a registered psychiatric nurse, he recognised that his condition of depression and anxiety and potentially suicidal feelings could only be ended by breaking out of the situation of uncertainty he felt he was in with Lundbeck. Mr Acquah gave evidence at the hearing that at this point, “it has got to the stage where my mind wasn’t thinking straight any longer…so I just had to break free”. Accordingly on 23 August 2002 Mr Acquah wrote to Mr Maritz, managing director of Lundbeck, and handed in his resignation, expressing a desire to depart as soon as possible. Lundbeck replied: “In your letter of 23 August 2002 you also expressed a desire to `depart as soon as possible’. As discussed on Tuesday morning, Lundbeck will agree to your request not to work out your notice period. However, if you choose to do this you obviously forfeit your entitlement to receive salary that you would have received had you worked until 26 September 2002 and you must return all company property to Lundbeck immediately”. Almost immediately after resigning Mr.Acquah sought to revoke his resignation as he had done so in a state of panic and confusion. Lundbeck refused his offer! In my opinion, despite a declaration by lundbeck that they have taken it upon themselves “the task of improving quality of life for persons with a psychiatric or neurological disorder”… if this company have such little regard or compassion for an employee suffering from depression, what hope have consumers got? Mr.Acquah’s case was dismissed. The Judge requested that lundbeck consider with compassion all the circumstances of the case, including the stress Mr. Acquah had felt, the depression he has experienced and his family situation, before it makes any decision with regard to a cost application in this matter. Strange how they had to be told! Previous postGSK, Merck, Johnson & Johnson and Sanofi-Aventis helping the third world? Maybe not! Next postThousands Suing over GSK’s Diabetes Drug prescribed in Ireland. Great digging Leonie. It seems Lundbeck talk the talk but almost definitely do not walk the walk. Keep on at em and Bravo for getting the message out to students at the Trinity College. Pity the church won’t speak out, then again, their affilation with pharma has been well documented over the years.